In 1530 when the Knights first arrived in Malta they went to live in Mdina, the island's capital, but then settled in Birgu or as it is otherwise known Vittoriosa. We start with a walking tour of the 'Collacchio', the historical centre of Birgu which is a maze of narrow winding streets. During our tour you will pass the original Auberges which the Knights lived in, the old armoury and the hospital. We will visit St Joseph's Oratory which is a small church museum containing various relics of the Knights and other items of interest connected with the church and Birgu. The actual magisterial hat and sword used by Grandmaster de Valette during the Great Siege of 1565 have been recently restored and are exhibited here. At this point we make our way to the Birgu Waterfront. This is lined with majestic buildings because according to the Knights, visitors had perforce to approach Malta by sea and their assessment of the island was coloured by their first glimpse of its buildings which included beautiful and impressive palaces. They also built stores and warehouses. After a lunch break we continue with our tour to Valletta. 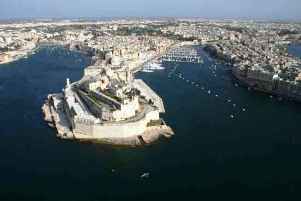 Valletta was built by the Knights of St. John in 1566 to further defend the harbour. The construction of the city was commissioned by Grandmaster de Valette. Here we include the Barraka Gardens which offer stunning views of the Grand Harbour and its magnificent fortifications, a walk through important streets so you can admire the impressive palaces and other historical buildings built during the period of the Knights and we will also include an internal tour of both the Grand Masters Palace State Rooms and the magnificent St. John's Co. Cathedral, which was the church of the Order and also home to Caravaggio's masterpiece "Beheading of St. John" amongst other treasures.